Mount Logan Trip Report, May 19 - June 21, 2009. THIS TRIP REPORT is UNDER CONSTRUCTION. WHAT IS BELOW is just a scheleton, ALSO MANY PICTURES are MISSING. 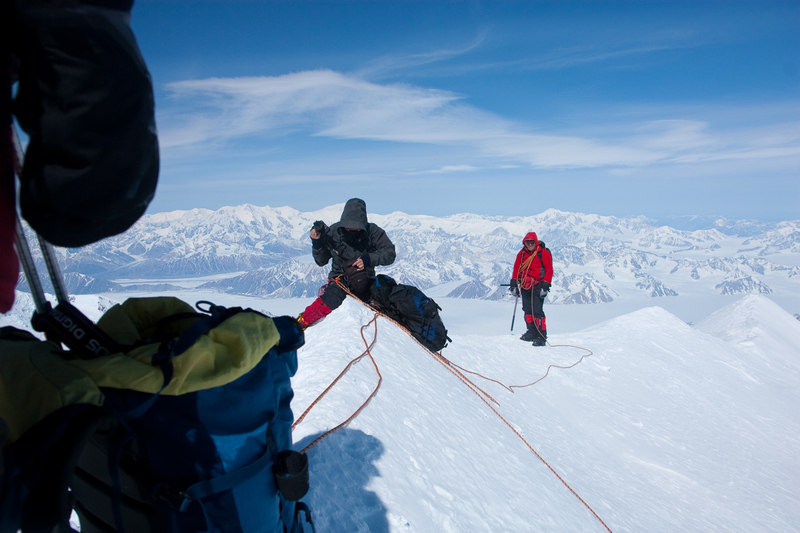 Climbing Permit: Any party considering a trip to Mount Logan should first check out the information provided by the Kluane National Park where Mount Logan is located. 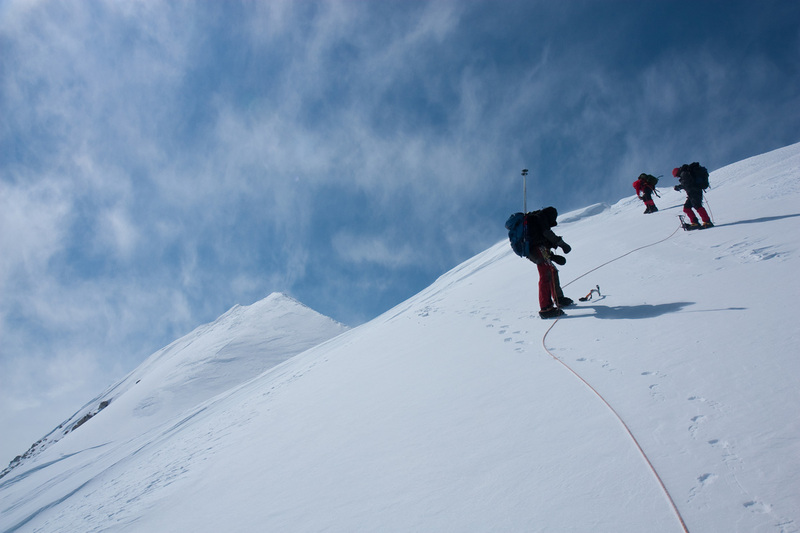 Within the Kluane WEB information, locate the subsection about mountaineering and the requirements stipulated in order to obtain a mountaineering permit. Our expedition had the official name "Logan09 - Bergen Fjellsport to Logan", essentially "Logan 2009 - Bergen Mountaineering Club to Logan." As part of the permit process, the Kluane Park has produced a video about mountaineering in the Icefields that they require all mountaineering visitors to see. Although there is no fixed deadline for applications, it is highly recommended to start the permit process several months before the intended trip. 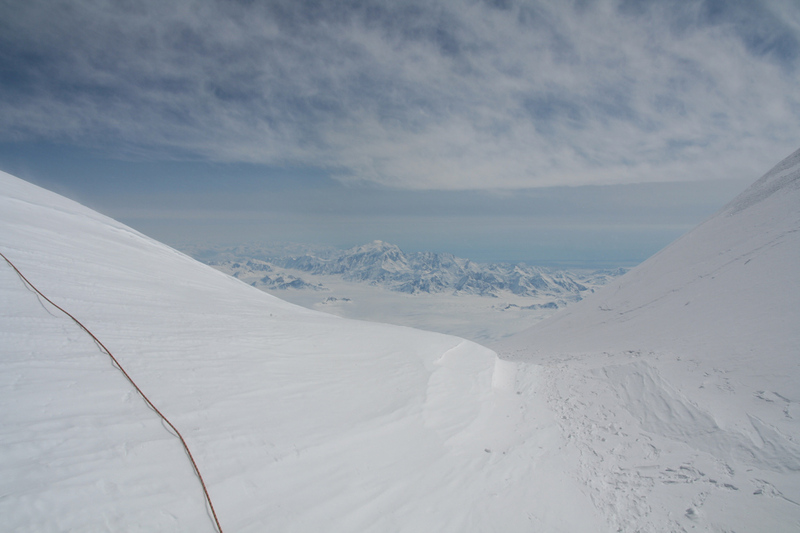 The recommended period for climbing Mount Logan is in May and early June. 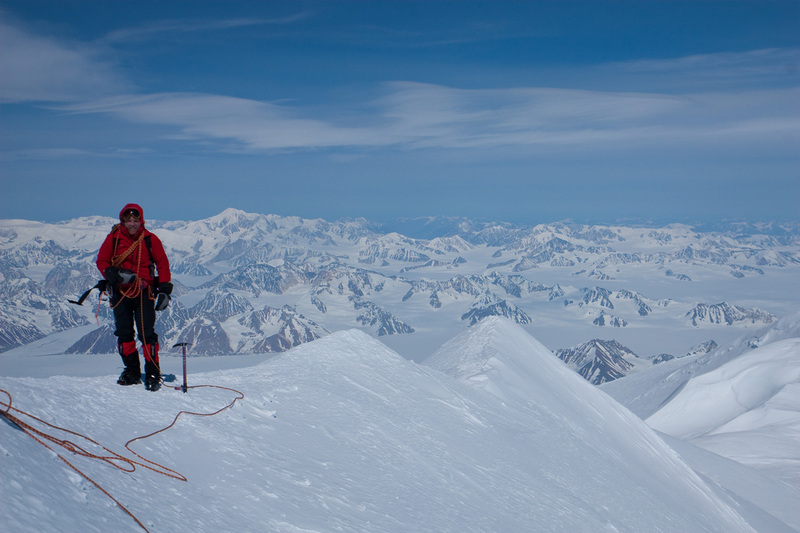 In 2009, the activity on the mountain was quite compressed, the first ascent in 2009 took place on May 22, while our team was the last team to summit on June 3rd, ie. within a two week period only. Clothing, Boots, Tents and Climbing Gear: Good clothing for winter mountaineering in Norway is largely adequate. Thus, the team members had most of what was deemed necessary. A few supplemental purchases are almost always done, if not as an excuse to get a piece of equipment that has been wanted for some time. Unlike what is often quoted in American literature, we all believe in a first inner layer of wool. Devold, "worn by Norwegians since 1853", can be recommended, there is also Arctic Brynje, warm inner clothing that can be used every day on extended trips like this one. A second layer of wool should be taken as sleepware, this layer can then also be used on summit day for extra warmth. As a next layer, we all used fleece. Normally, one would then put a windbreaker as the final outer layer. A single, extra fleece may also be useful, I carried a Patagonia fleece with no wind resistance at all, then a second fleece having a shell for intermediate wind protection. People have different preferences wrt. socks, I prefer a single, warm sock made of wool, a few times I double this with a medium thick wool sock inside the heavy duty one. Gloves are extremely important and any team should carry some spare, high quality gloves. I carried two spare sets for team use and Olav made good use of a pair of down gloves to keep fingers warm above Basin Camp. Finally, a good hat that keeps your head warm is needed, with adverse weather this must of course be supplemented by the hood from your mountain jacket. We all carried a down jacket as well, but mine stayed in the pack and was never used. We carried three tents, two large VE-25 to be used as comfortable camp tents. These tents can easily accommodate three men, however, for long duration climbs like this, it is certainly extra comfort to have ample space in camp. We carried a single 60 meter rope for glacier travel and general team security, 4 snow pickets, 2 deadman snow anchors and a couple of ice screws. The latter was mainly for crevasse rescue situations, while the snow pickets were Harness, prusisk loops as well as crampons and an ice axe completed the personal gear. Food and Cooking: We ran a pretty standard and simple regime wrt. food and meals. We carried two multi fuel (Primus) propane/buthane as well as (MSR) white gas stoves plus spare parts (a spare burner). Two pots per stove, 12 liter of white gas and 4 containers of propane/buthane gas. Normal practice is to buy the white gas at Base Camp, in order to avoid taking it on each and every flight. Breakfast was always oat porridge with brown sugar and raisins as well as some hazelnuts. Lunch was biscuits, power bars and general trail mix, while a freeze dried standard dinner served us as the main meal every afternoon. A couple of better tasting meals had certainly been nice, however the general ability to enjoy good food almost always deteriorates at altitude, thus it is not obvious that such extra "luxury" had been effective with respect to team performance. Experience from past trips to Greenland continued to hold true here. On 2-4 week trips in arctic environments with generally hard physical work every day, the above food regime will leave a deficiency of about a quarter to a half kilogram of body weight per day. Thus, each team member lost somewhere between 5 and 10 kilogram on this trip, not necessarily bad. We carried a full week of provisions that we gave away at high camp the day after we came back down from the summit. Similarly, we ended up giving away almost two full containers of white gas before descending from Basin Camp. Day -2, May 19th. We fly from Norway. I got up at 0500 in order to catch a taxi to the Bergen airport and make the agreed upon time to meet the other members of the team. Our flight was Bergen - Oslo - Newark - Seattle - Ancourage, too bad that SAS has discontinued their direct Copenhagen to Seattle flight, a flight I have taken numerous time, first time in January 1976. Arrival, local time (- 10 hours) at 0045. Our taxi from the airport in Anchorage to Earth Bed and Breakfast cost US dollar 22. I had agreed ahead of time that we would sneak downstairs to the big room and try not disturbing anybody until the next morning. We all slept by 0200. High time to catch some sleep in our assigned (basement) room, a big room with 4 beds scattered along various walls. Day -1, May 20th. Shopping in Anchorage. We woke up reasonably (given the jet-leg) and had a tasty breakfast that the friendly ladies at Earth Bed&Breakfast had already prepared. Called and verified that the pickup the next morning would be at 0800 as planned. We then set out to buy all the various items that deliberately had been planned for Anchorage, partly to save weight on the airplane and partly due to the US (protectionist) regime of not permitting even freeze-dried food to be imported. We first went to the REI store where we bought so many items (100 day rations of various foods) that the cash register proclaimed: "Too many items", before we completed. No big problem, two receipts instead of one. Another problem came to light, I had brought an empty fuel bottle for our Primus stove, however whoever contributed the burner had (not unreasonably!) assumed that I would bring the fuel pump with the bottle, while I obviously had thought that a fuel bottle is just a fuel bottle and that the pump would come with the burner. REI had no fuel pump. The nearby Alaska Mountaineering store had a fuel pump, but wanted to sell it as part of a complete stove set. After some discussion, we were able to secure the pump for dollar 50. We bought 4 gallons of white gas (filtered gasoline) and 6 full size cartridges of propane/isobuthane for our multi-fuel Primus stoves. Next to the REI store is a big grocery store named CARR, this is the place to buy soups, breakfast mix, nuts, chocolate, brown sugar etc. Satisfied with our shopping, we enjoyed a nice luch at Gloow Brewery. The day finished with a late dinner on main street, then back to our Earth B&B for a good night of sleep. The other party staying at our B&B place, was two Swiss climbers. They were also headed for Mount Logan, but with a slightly more fancy plan in mind. They would climb up the East ridge, then do a para-glide back down to base camp from the very summit of Logan! Day 0, May 21st. We travel from Anchorage to the Alaska-Canadian border. Pick up at the B&B according to plan, shortly before 0800. The truck was driven by two brothers, age 17 and 21. We also picked up a married couple from San Diego. They had planned for spending one week in the mountains. We arrived in Chitna around 1330 after a most scenic drive that mostly ran up a huge valley with very impressive mountains on our right hand side. It occured to me that I clearly had driven in the opposite direction with my wife back in September 1981. Just before a major road fork, we had good views of two big mountains up front, one staright ahead, the other slightly left. Paul Claus arrived and we flew shortly before 1415. Touch down at the Alaska Canada border in beautiful sunshine around 1530. A very scenic place indeed. Mount St. Elias is very impressive, but so is also Kings peak with Logan behind it. We put up camp, Helge tried to do so right behind the airplane and I had a very good laugh seeing Helge holding on to the tent in the wind created by the airplane trying to get going. We had some slight trouble with the fuel pumps for our stoves. Neither Helge's pump nor the one we just bought in Ancourage seemed to build enough pressure. However, with some patience and more work on the pumps, we got our dinner well prepared. Our first camp, Camp I, well established. May 22nd. Good skiing to the base of Mount Logan. I woke up at 0500, a brilliant sunshine, bút quite cold before the sun struck the tent. We measured -11 Centigrade inside the tent. Breakfast, then preparations to break camp. We all departed at 0910. The glacier was nice for skiing, it was not the galcier I had planned, however this was of no consequence. Åke had some initial trouble with his sled attachment to his backpack, a small repair and things worked better. Helge got a bit tired towards the end of the day and we decided to camp already at 1415, just a bit below Kings Trench. The weather is still perfect. As we put up camp, a tent pole broke near its end and we needed to make use of a spare. With Camp II well established, there was still time to enjoy the scenery all around. A delicious dinner in the sun. We observed two men skiing downhill with empty sleds behind them. They were quite a bit away and we did not make contact. Their camp is further down near tracks from a ski plane, this is the Canadian base camp for teams flying in from Whitehorse. Perhaps they did a carry and will move camp tomorrow. We may see them then. We all went to bed at 2030. May 23rd. We ski up the lower half of Kings Trench. Woke up and checked the temperature at 0600. Minus 10 Celcius. The sun hit the tent at 0630 and it immediately seemed to help. The time is now 0700 and the temperature in the tent is now plus 16 Celcius, perhaps time to get up? The same nice weather today, this expedition has certainly started out very nicely. Afer some more skiing, we came upon a camp at 3250 meter. There, we met a man and a woman each with what looked like rather easy sleds. They told us that they were going down since she did not feel very well. The guy could tell us more information. They were part of a team of 4 climbers, the other two were up at Kings col to explore if they could get any higher. He could furthermore tell that a guided group of Canadians, 5 in all, were camped at Kings col. Also, two Austrian climbers had given up and descended yesterday. They were likely the two men we spotted from our camp. More alarmimg was the news that also 2 Italians, the two that Paul Claus had been flying in about 4 days ahead of us, had also given up in the icefall above Kings col. One of the Italians, Hans Kammerlander, is a world famous mountaineer. He used to be a partner with Reinold Messner. The guy told us that the Italians had cached tent and skis and supplies, but that a giant crevasse had opened up and swallowed all their supplies. They had subsequently returned back out towards the Alaskan border on foot. They must have passed while we were inside our tent. Kammerlander, having summited K2, was now on a quest to climb the worlds seven second highest summits (on each continent). The reporting man said they thought it was worse than the Khumbu icefall on Everest and the other Austrians had given up just by hearing this story. This was indeed potentially bad news, but I immediately decided that our team should go up in the icefall and explore to see if any possible route existed. We continued another 30 minutes and established camp III at elevation 3310 meter. The weather is now more cloudy up towards Kings col. We all felt good about relaxing in the tent after todays work. May 24th. We arrive at Kings Col. I made a short trip out at 0600. The same, perfect weather continues to hold. Minus 8 Centigrades in the tent this morning. When does the sun hit the tent here? The sun is not as early as back in Camp I, we leave camp at 0945. This day turned out to be a hard one. The next hill on the glacier, in fact the first and only significant hill in Kings Trench, was steep. After quite a bit of hard struggle, we decided to pull the sleds straight uphill on foot. Two men on each sled and a return for the next load. It was only a few hundred meter, so no big deal. Still, the remaining distance was uphill and the weather turned slightly worse. We were all pretty tired when we arrived in Kings col at 1630. The Canadian team, two guides and three clients were still camped here. Later, we talked to a team that had put the first few members on the summit this season. They had used 8 days from Kings col to the summit and back here. 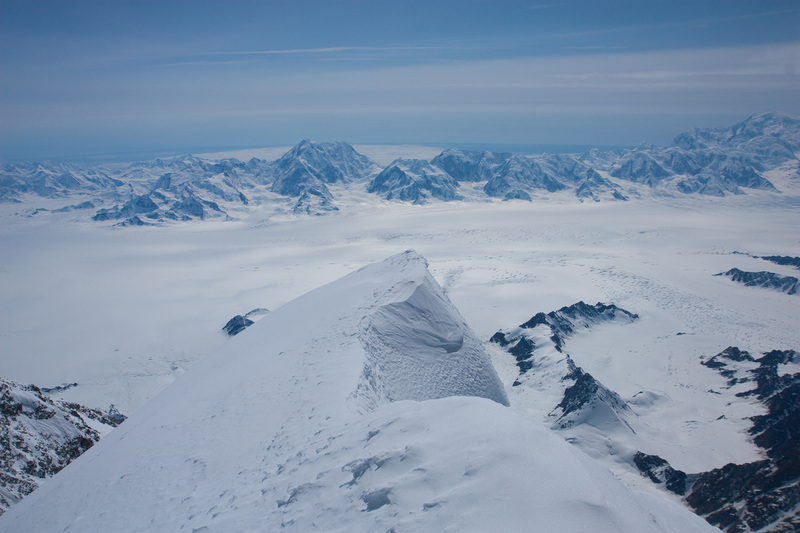 Mount Logan is a very large mountain. We establish camp and take a check on the team. Espen reads 74 in oxygen saturation while running a rest heartbeat of 94. This is Camp IV, a major camp since the steepest part of the route is just above us. We will have a rest and acclimatization day here tomorrow. May 25th. Rest day, we explore the lower part of the Icefall. Minus 8 Centigrade in the tent this morning. By now, the time is 0730, the sun is hitting the tent and the temperature inside is +5 Centigrade. We shall have a relaxed day here after a very successful single carry trip to here from the Alaska border. Espen did a small tour around camp today, while Åke, Helge and I took a load of food and fuel up to a camp located at 4520 meter. The other team had used it and built some impressive snow walls. The place is on a balcony sort of half way up the ice fall. It was very hot to carry in the steep terrain on foot. However, the route up to "the castle", as we came to call this camp, is in good condition. We needed to cross a single, somewhat complex crevasse, otherwise all pretty easy. The guided group started early and went all the way up to the Football field, that is a rather large plateau above the problem area with the huge, blocking crevasse. The team that descended yesterday had explained a route across some rather large seracs that are standing all the way out near the steep cliffs, that is all the way to the right hand side when viewed from below. This is good news indeed. It is hard to understand why Kammerlander turned back. The story (told by the Austrian guy) was also more dramatic than reality. Kammerlander's tent and ski was nicely located on the football field. We shall see what tomorrow brings. First and foremost, we need to carefully evaluate how Espen is adjusting to elevations exceeding 4000 meter. Pretty happy with the day, food for 6 days has been moved up to the castle. May 26th. We make a carry to Camp 4. We got up AFTER the sun had heated our tent. The guided group is making a carry to the Football field today. This is a pretty large vertical gain. I decided that we shall establish an intermediate camp at the Castle. Today, we moved skis and two sleds plus more supplies up there. It took us 2:45 to make the carry uphill, subsequently one hour for the descent. This is pretty similar to the time we spent yesterday. The weather has been rather hot with shifting clouds drifting around. Espen got tired towards the end and I carried his pack on my sled. Tomorrow, we shall move up to the Castle. The team from Quebec that built the Castle, did an impressive construction job, large snow blocks creating solid walls. The other (guided) team has also put in a very impressive effort today. They carried from Kings col and all the way to the Football field, quite some way above the difficult crervasse area. They were back after a 10 hour effort. One of them lost a fuel container just above us. Chasing this container, he was completely unaware that his backpack also started sliding. We rescued the situation by shouting to him. He understood what was aboutto happen in the very last moment, chased across and caught his backpack. Drama on Mount Logan. May 27th. We move up to "The Castle" also called Camp V.
May 28th. We bypass the big crevasse and carry to Camp VI. roaring wind at the higher elevations and clouds are covering up most of the terrain below us. May 29th. We move up to Camp VI - the footballfield. higher up. I brought some extra pairs of heavy duty gloves, one action is to make Olav try these. May 30th. We make a carry to Camp VII - a windy col.
has been bad enough to prevent ascending up here to Basin Camp. May 31th. We decide to take an extra rest day for acclimatization. June 1st. We move up to Camp VII - our highest camp. June 2nd. We cross Prospector Pass and move to Camp VIII. June 3rd. SUMMIT DAY !! Detailed pictures from the summit area. Since there is a bit of confusion about the details near the summit of Mount Logan and since many teams either fail to climb the proper summit or end up climbing the West Summit instead of the main summit, what follows here is a fairly detailed and illustrated description. 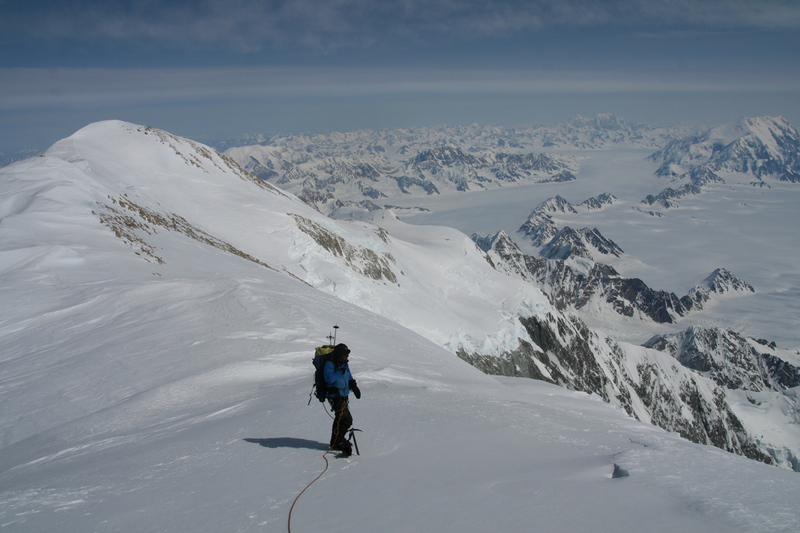 The best way to climb the proper summit of Mount Logan is to establish the last camp fairly low, at the lower end of the valley that extends down from Prospector Pass. See the description of our Camp 7 above. 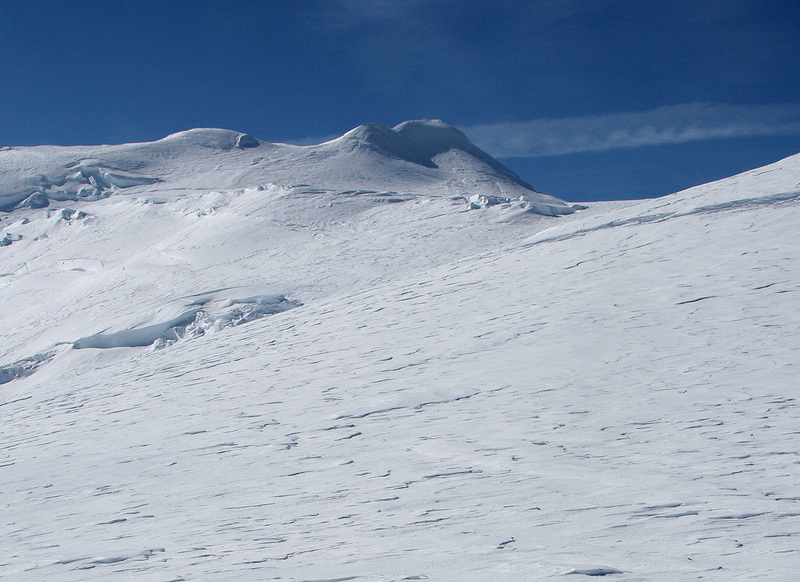 It can be seen from this picture, that the summit area consists of a small (false) summit followed by a longer summit ridge. The summit is at the very end of this ridge. 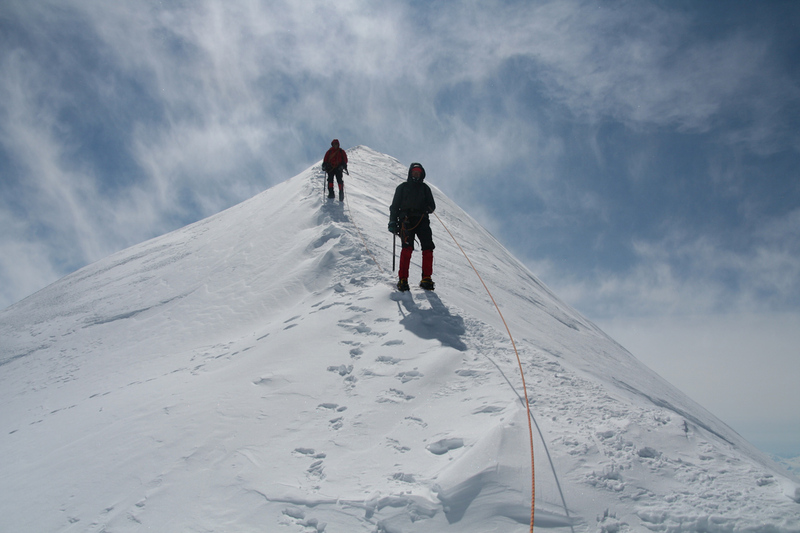 One need not climb completely across the first summit, it may be partially traversed on the left side (as seen in this picture). The final ridge is coming into view, one can see that there is more terrain behind the first steepish slope. 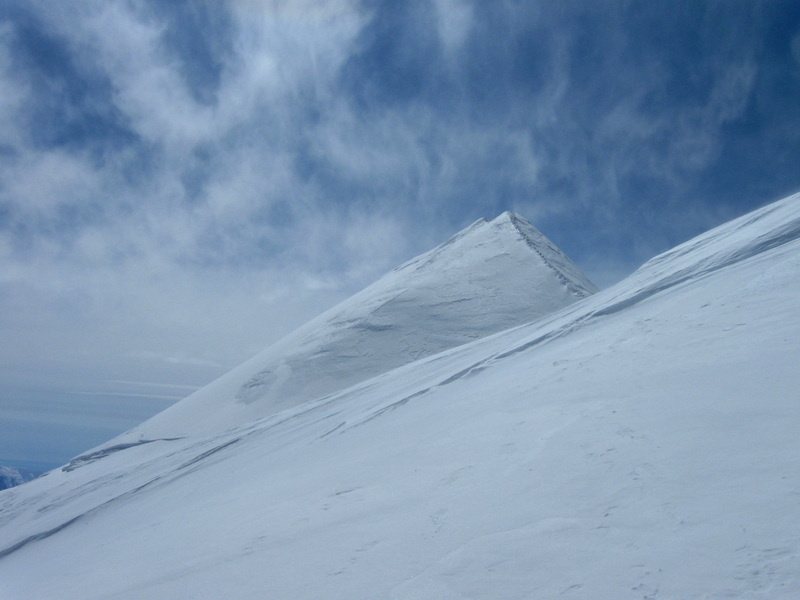 One will then arrive at a quite small, but distinct saddle where the summit ridge begins. In this picture, we are in the last saddle, unfortunately, the view is lokking back towards the East summit of Logan. Looking up from this saddle, we can see the beginning of the summit ridge, this photo is credit Thomas Laussermair, a participant on the commercial Canadian expedition (Canada west Mountain School, led by Rich Prohaska) that was on the mountain at the same time (they summited two days before us). This ridge is fairly steep and falls off a long way to the left (when ascending), the slopes gets steeper as one moves towards the summit. After the steady climb up the first part of the ridge, one arrives at a section which is almost flat, this is followed by a new, rising ridge, narrow, but rising more gently than the first section. One can see this part of the ridge quite well on this picture. Åke is still not at the very summit, but he is getting quite close. Finally, the ridge tops out and one has arrived at the highest point of Canada. The famous Hummingbird Ridge begins here and runs all the way down 4000 vertical meter. 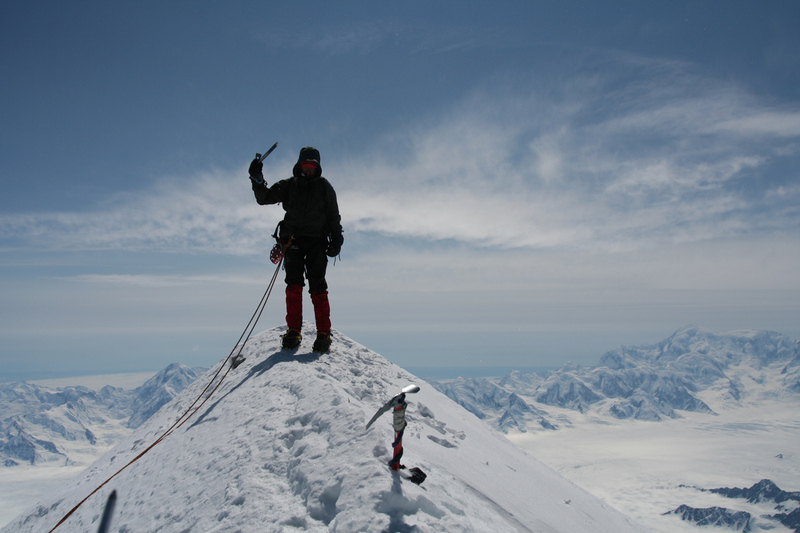 (Climbed in 1965, 35 days, Allen Steck) One should really NOT move beyond the highest point! Next, this picture shows me sitting with one leg down either side of the ridge, while Åke is patiently waiting for more space to free up. The picture gives a pretty good outline of the upper part of the summit ridge. After sitting for a while, Espen and Helge moves down and it is my turn to stand on the very top of Canada. The descent provides further details of the ridge. Here, Espen has just arrived at the top of the steepish ridge. This picture looking back towards the summit is taken at the same time (within one second). We are using the full length of a 60 meter rope and one can see that our last man, Åke, is already well along the ridge below the summit. 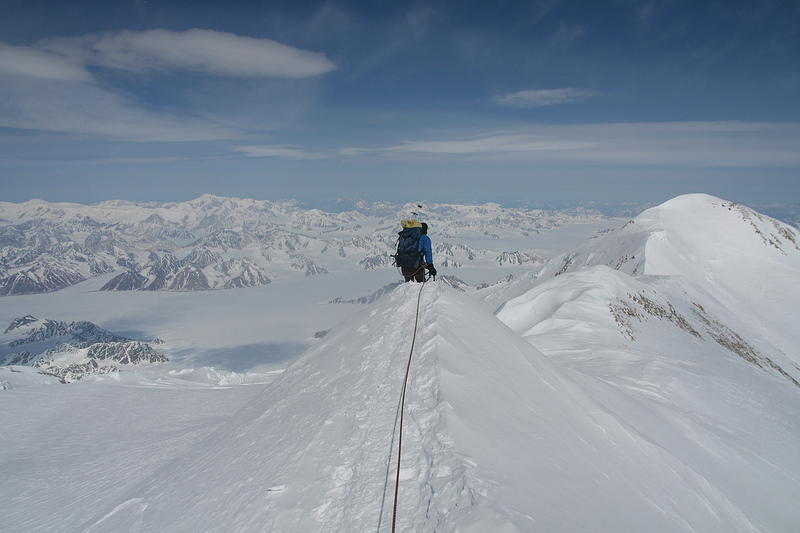 Next, Åke follows me as we descend the last ridge that ends in the saddle between Mount Logan and the false summit. Finally, we are back down in the saddle from where the the summit ridge starts out. June 4th. Return to Camp 4 - the Castle. downhill, this had been a pretty tough day for everybody. June 5th. Descent via King Col and down to Camp 1. June 6th. Ski back to the Alaska border. June 7th. We fly out and visit the Ultima Thule Lodge. June 8th. We hike around the forest near the lodge. June 9th. 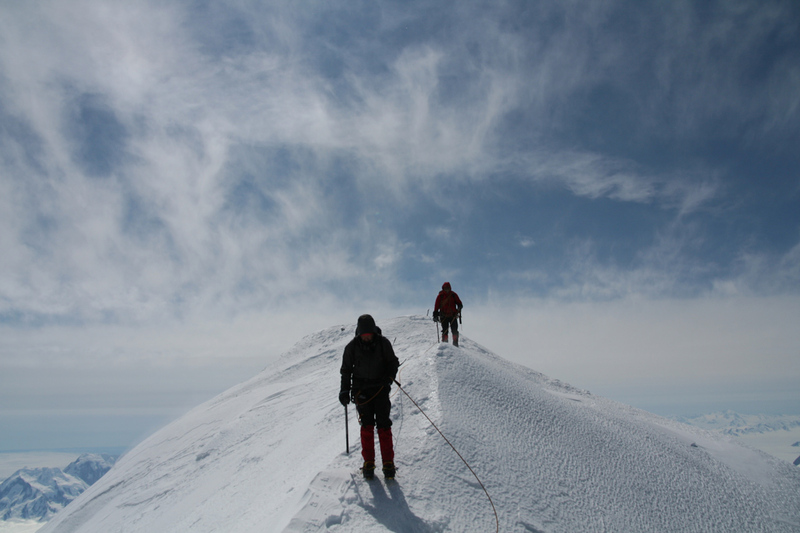 We fly to Mount Blackburn and climb to camp at 3900 meter. June 10th. SUMMIT DAY !! June 11th. A steep descent into fog and snow. June 12th. Snow and more snow, no pickup by Paul. June 13th. Snow and more snow, no pickup by Paul. June 14th. Snow and more snow, no pickup by Paul. June 15th. A short break promised by Wendy, we fly to Ultima Thule. June 16th. We fly out and drive to Anchorage. June 17th. We rest and recover. June 18th. We go watching for whales. June 19th - 21st. We travel to Norway. After the Trip, Wrapping Up. distance as well as elevation and average slope is available. Also, see the detailed readings of heart rate and blood oxygen saturation as plotted here.